Anticipating a shingle-style retirement home, our clients agreed to consider something less traditional, perhaps more modern, even unusual. 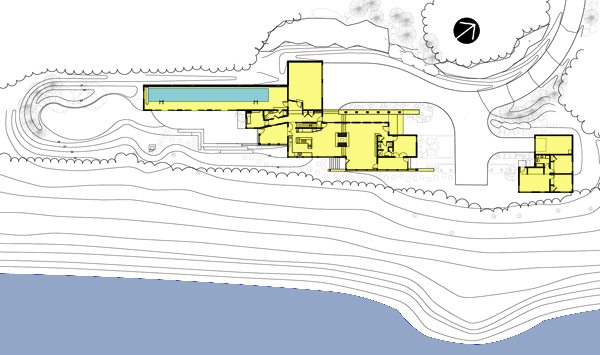 The house sits on a narrow shelf parallel to the water, nestled under large pines. The staggered linear plan responds to the shelf, the water’s edge, and the sun. The open main level presents kitchen, dining, and living spaces. 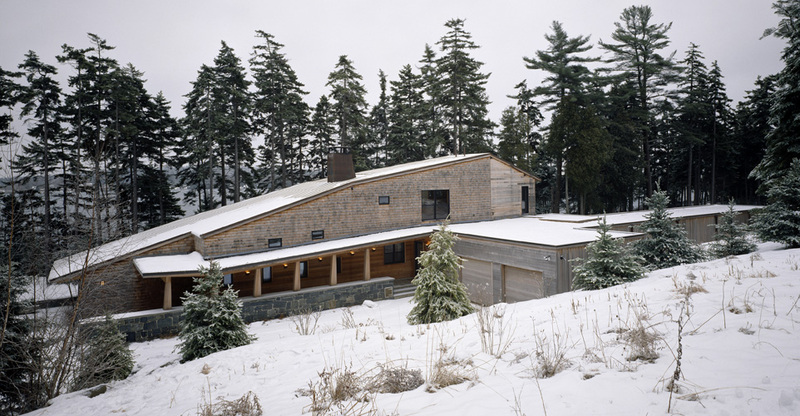 A guest suite, study, and several screened porches complete the public domain, except for the lap pool: its slate-shingled, battered wall “retains” the slope, and oversized glazed doors face the water. The orthogonal plan is counterposed by the curved, ribcage-like ceiling. Interiors are clean and clear; natural materials (wood, slate, flagstone, bluestone) are used not in typical rustic ways, but as distilled iconic elements.